Are you one of the aspirants of the University of Ilorin who had been facing some issues since the Post UTME/DE registration started? Sorry dude. But I have solutions and ways forward for your challenges. Kindly read to the end. In this case, you will have to keep checking the post UTME screening portal regularly to see if the course has been changed. JAMB will have to send your new choice to the school. All above activities will occur (as expected) before August 6 when the screening is expected to end. You should consider another course as advertised by the management. IMPORTANT: Make sure you do the same change of course on JAMB portal too. This is highly necessary. A notification page for a student not qualified for course applied for. Consider the change of course option. Click on the picture to see clearly. Keep trying. The school ICT is working continually on this issues. I had been able to pay for some candidates with this issue after retrying couples of times. I suggest retrying like twice a day – morning and evening. Note that the screening remains opened till August 6, 2018. So relax. Notification of payment error. This is technical. Click on the picture to see clearly. I have seen couples of this situations. 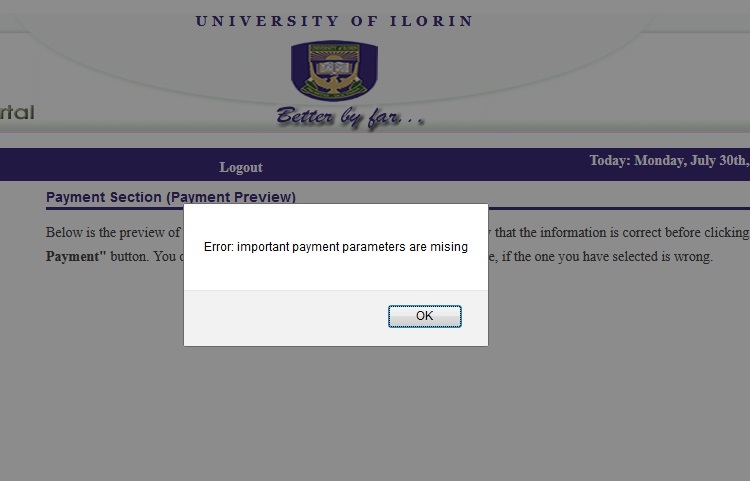 Anyway, UNILORIN can so stubborn sometimes. A candidate of mine combined right subjects in UTME for Educational Management - as detailed in JAMB brochure. Yet, the school says it’s wrong. Unfortunately, they didn’t tell us their right subjects. Checking on their website for the right subject, they didn’t list Educational Management among their courses. 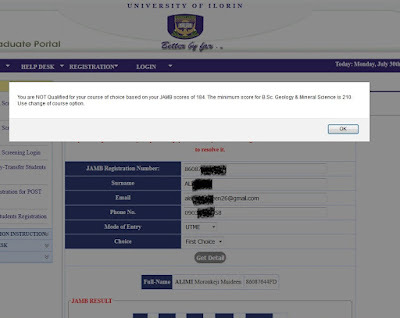 A notification page for a student with a wrong subject combination for UTME. Consider the change of course option. Consider the change of course to another course. Make sure check the school portal for the new course and be sure you have the right SSCE and UTME subjects for the new course. I think I have been able to help with this quick guide. If you have further question, kindly drop it in the comment section below. If you changed your course on the school's portal but you have not done that on JAMB portal, please quickly do the change with JAMB. This will make your choices conform with each other. In recent years, candidates who didn't do the change of course on JAMB portal were later denied admission by the University of Ilorin. Please take note. You must have some contacts this post will help, share it with them using WhatsApp, facebook etc icons below. pls how soon should I change the same course on jamb portal? ?can I still do it after post jamb exams or befor? pls I beg reply me..... thanks! 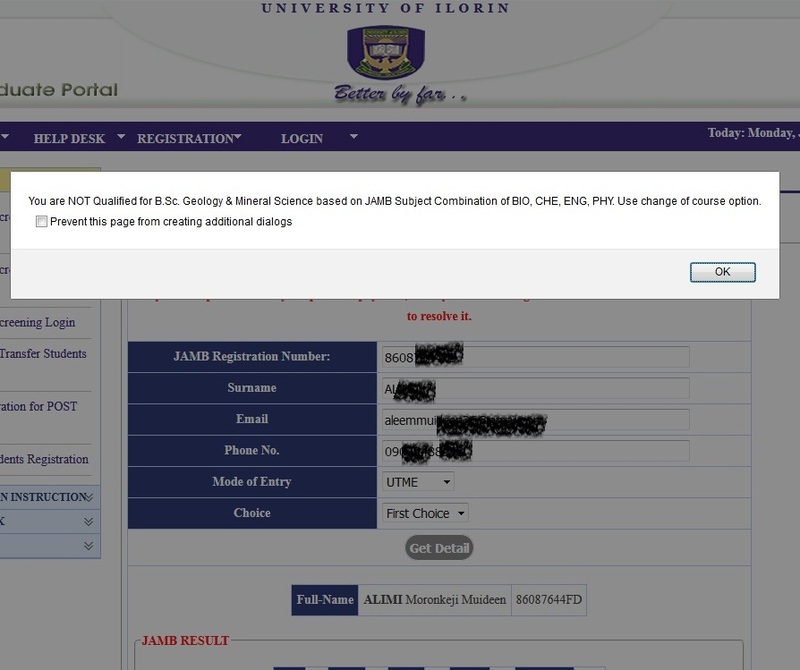 I applied for law and I was given social studies on jamb caps .but unilorin portal is telling me not yet recommended for admission since last week monday. Should I do a change of course? Pls, I went to register for jamb yesterday and when I got home back home, I discovered I selected a wrong subject combinations, pls can I still change it before the jamb exam commences? You can copy to the browser before you can read it.